When I was 18 years old I was struck by an ad in a magazine. I’m pretty sure it was an ad for shampoo. I know, you’re thinking, “Man, if I had a dollar for every time my life has been impacted by a shampoo ad in a magazine, I’d be rich!” Happens all the time, right? I was fairly new to my faith at that time and the words on the ad resonated with me because I was learning a lot about the power of forgiveness and letting go. I’m sure the marketing executives who designed the shampoo ad were referring to having less build up on our hair or something, but I took it as a reminder that the journey of life is long and if we want to be free to go where life takes us, we need to lay down our heavy burdens. For 20 years straight, I’ve had that saying posted on my wall. After a few years the initial magazine clipping was bent and worn, so I printed it out on a piece of card stock and I still look at it every day in my office. At each stage of my life, this little phrase has always served as good advice. When I’m tempted to dwell on old hurts and offenses, I remember that life is a journey and I can’t carry that stuff with me. When I’m faced with a fresh hurt, I remember that life is a journey and I need to let this roll off me. When guilt resurfaces over something long since dealt with, I remember that life is a journey and guilt is too heavy. When I’m crippled by people’s expectations, I remember that life is a journey and I’ve got my own path to walk. When I want to cling to personal possessions, I remember that life is a journey and belongings weigh me down. When I feel scared about not having something when I need it, I remember that I don’t really need much. And I have never gone without. And travelers often find their needs met in unusual ways. I think the longer we’ve been on our life’s journey, the more likely it is that we’ve allowed ourselves to become burdened, without realizing it. We’ve been hurt more. We’ve accumulated more. We’re afraid of more. And all of that prevents us from moving forward in our journey. So when we’re faced with taking a big step, we find we can barely move our feet. But what about my stuff? But what about my future? But what will people think? But what if I need something and I don’t have it? 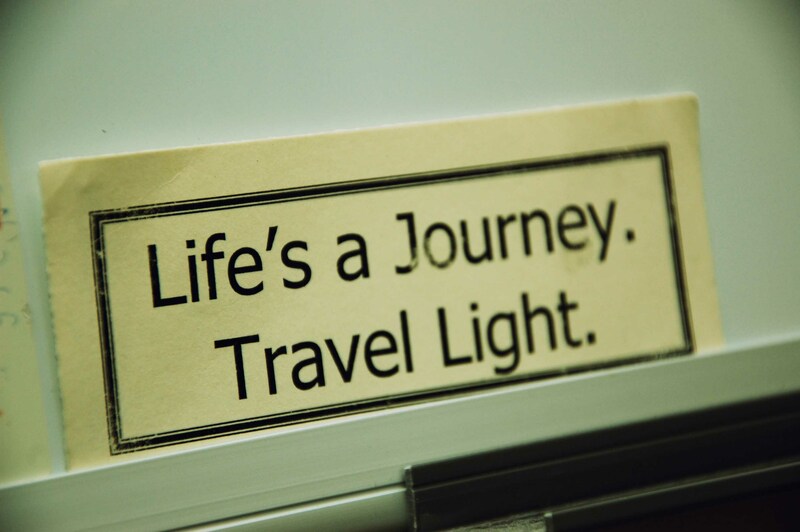 Our need to let go and travel light never ceases. I have discovered that this advice has never been more applicable to me than right now. We find ourselves preparing for a move overseas and I’ve come face to face with the burdens I’ve started carrying that slow down my journey. It’s a great process, really, asking myself what I’m holding onto that I think I couldn’t let go of. Am I meant to carry it? Is it preventing me from moving on to something more meaningful? Because what do I really need? What really matters? When it comes down to it, life is entirely about relationships. Relationship with God and relationships with people. And I don’t need much of anything for that. In fact, sometimes the “stuff” of life just interferes with that. If we spend our lives offended, guilty, accumulating, and trying to meet everyone’s expectations, we can easily become too burdened for slow, meaningful, authentic relationship. And so I’ve decided that I am willing to let go of everything, except relationships with the people I love. Who are the beautiful people God has put in my life and how can I invest in them and love them, near or far? Because that is the goal of my life’s journey – to love God and to love people. And with those two priorities alone, I’ve found that my bags are pretty light indeed. If you read my blog regularly, you may have noticed I seemed to have fallen off the face of the cyber world for the last 3 weeks. I would explain my mental state over the last month as paralyzed. Wanna know why? It’s a long story, so if you really want to know, here’s the whole deal. I re-purposed this blog back in March because I had a new vision. I wanted to write about making intentional choices toward a life of passion and meaning. About actively working to do what God has put on our hearts instead of passively moving with the flow of our culture. About making difficult choices if it means fulfilling our mission. Of course, I should have expected that God would want to know how serious I was about all that before he’d give me a voice to write about it. I thought we’d already made our difficult, intentional choices. Stepping away from stable jobs, starting our own business, homeschooling our kids. Those were choices we made because God gave us a glimpse of a different future. They were hard and scary moves. But now I see that those steps of faith were not an end in themselves. They were simply that – steps. Steps toward the next big move God had for us. Preparation, really. The image I have of our family, which I shared with them a while ago, was of a hot air balloon tethered to the ground. (If you’d like a more complete visual, Josiah said the balloon should be red and Abby said it should have a butterfly. So there it is. Our red butterfly hot air balloon.) Over the last couple of years, it seems like God has been cutting some of the ropes that tether us down. Dwayne’s job. My job. The kids’ school. We were left with just a couple of ropes tying us to the ground. Strong ropes, mind you. But as we started to consider options for our future, we found ourselves asking God if he wanted us to tie down with more ropes, or cut the remaining tethers and fly. So, I expected God’s answer to my requests for provision and direction and peace and purpose would come in the form of a job offer in Langley, where Dwayne currently works as a TOC. But instead, God laid in front of us an opportunity to go to Abu Dhabi. It’s okay if you don’t immediately know where that is. I had to look it up to double check when I first saw the posting. “Is that the capital of Ethiopia?” Yeah, that was my first thought. “Or is it in the Middle East?” Hey, I got it on my second try! Well, a month later, I know A LOT about Abu Dhabi thanks to the world wide web. And in another few months, I’ll be able to write about our first hand accounts there, because we’re heading there in August. Dwayne has accepted a two year teaching contract with the Abu Dhabi Education Council, so we’re off to live in the desert! Even though there are many things about this process that are painful, we are super excited for the adventure that awaits us. In many ways, this journey feels like too much to share in one post. My journal entries, since February especially, are full of underlined and circled thoughts that I see were all leading to this decision. One in particular really stands out to me. On February 13th, I wrote, “Jesus can use all of us to tell his story. He takes ordinary men and women and says, ‘I’m going to unleash you. '” I circled and starred and underlined “I’m going to unleash you,” so many times and didn’t really know why, except that I felt God was really preparing me for a big change. 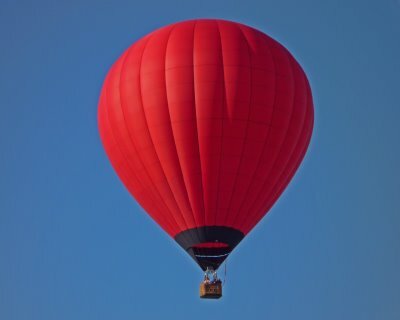 Then came the image of the hot air balloon. Then came this offer to move across the world. And although I believe I’m still only seeing a small part of what’s to come, I can see that God has been orchestrating this situation for a long time. In his grace, preparing our lives and our hearts to say yes to his prompting. So we’ll spend the next couple of months preparing to let loose the last tethers, and off we’ll fly! PS. Stay tuned for many more blog posts, because one of the things I’m most excited about in all of this is the chance to write about it, and the chance to photograph it!